Mike Wazowski - Monster University Paper Craft	. This template was submitted by Rian Rahardi from KertasCraft.com. Rian shares with us his latest template work, Mike Wazowski from Monster University 3D animated movie. This is the first pattern for a long time from Rian since quite a while he didn't produce any template. This template is the latest update, it's already resized into 2 times the original template which Rian made, so it will reasonably build-able. The template contains of 8 pages of patterns. The only hard parts are his leg fingers, they are quite tiny. 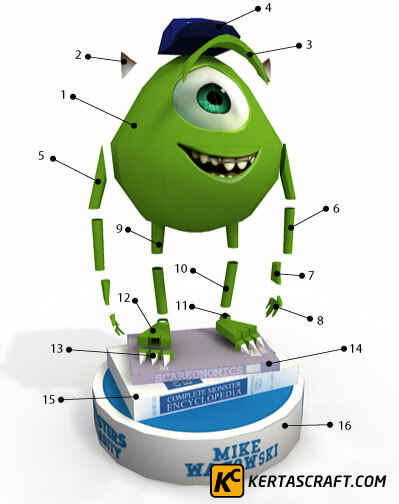 The template when it assembled will be depicting Mike Wazowski wearing a University hat and standing on top of 2 books and a display stand. I wish he will made his suitcase too, the one when Mike goes to college for the first time.